During the early 1900’s, Arkansas was a breeding ground for some of the world’s greatest bluesmen… Howlin’ Wolf, Albert King, Robert Lockwood Jr. and others. With his unique style of acoustic guitar, soulful, emotive vocals, and energetic stage shows, Lucious Spiller easily belongs on this list. After relocating to Arkansas from Missouri in his teens, Lucious met and performed with many of Arkansas’ blues stars like Larry Davis (co-writer of “Texas Flood”), who would become one of Lucious’ closest friends and mentors. 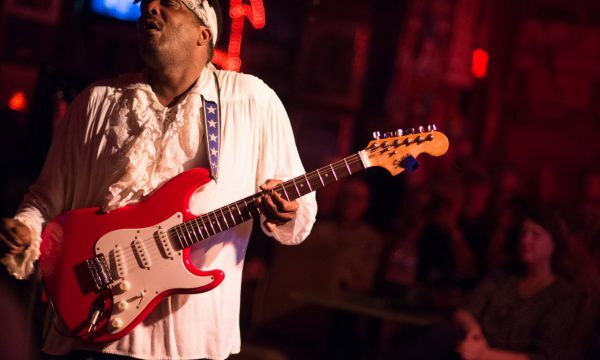 Lucious is an intense, flamboyant blues showman, equally comfortable playing deep, heartfelt blues or rocking, good-time party music, all brought to life by ferocious, unflinching guitar riffs, power-packed vocals and unlimited energy. It’s in his blood. His grandfather and great uncles, “The Salt & Pepper Shakers” were founders of “Black Prairie Blues” and have a marker on the Mississippi Blues Trail in Macon, Miss. Lucious’ early memories include watching his father and uncle, the legendary Chicago bluesman “Magic Sam”, playing at his home. Lucious’ own star continues to rise. He has been featured in Living Blues magazine and in the documentary True Delta, a riveting look at the vanishing bluesmen who lived the blues in their daily lives, and their desire to pass the torch to the next generation. He will appear in the premier episode of the internet series Moonshine and Mojo Hands a blues-genre internet series. He was a finalist in the Blues Foundation’s International Blues Challenge in 2012, and in 2014, placed 2nd in the IBC’s solo and duo category. A gifted teacher, Spiller has been a mentor to several of the Mississippi Delta’s up and coming blues artists, including two who will play the Festival’s main stages this year: Christone “Kingfish” Ingram from Clarksdale, MS; and slide guitarist Seth Freeman, from Arkansas, who now tours and records with Karl Denson’s Tiny Universe. With his blazing guitar work, his room-filling vocals, his self-defined blues style (a forceful mix of blues, rock, and gospel), and his boundless energy, Lucious is one of the finest practitioners of the blues today.